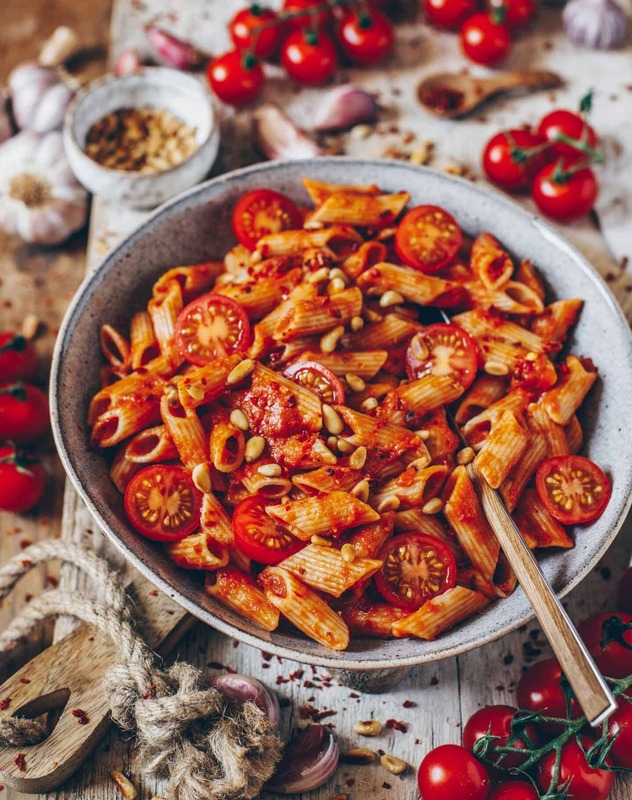 Pasta all ‘Arrabbiata has long been one of my favorite dishes. 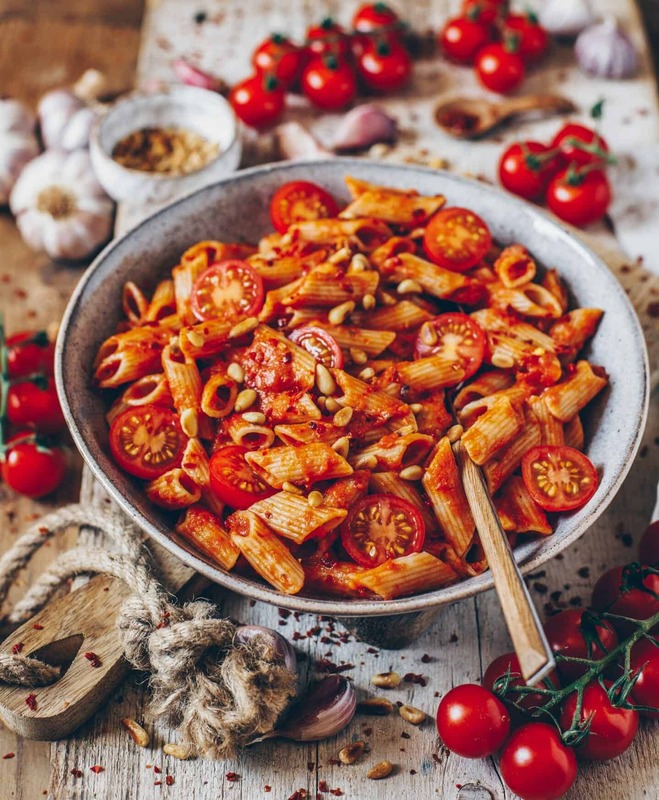 For me, there is almost nothing better than pasta with a tasty, spicy, fruity tomato sauce. It is also prepared quickly and you don’t need many ingredients. It’s a perfect meal if you’re short on time or just don’t want to spend hours in the kitchen. If you have all the ingredients at home, you don’t even have to go shopping. 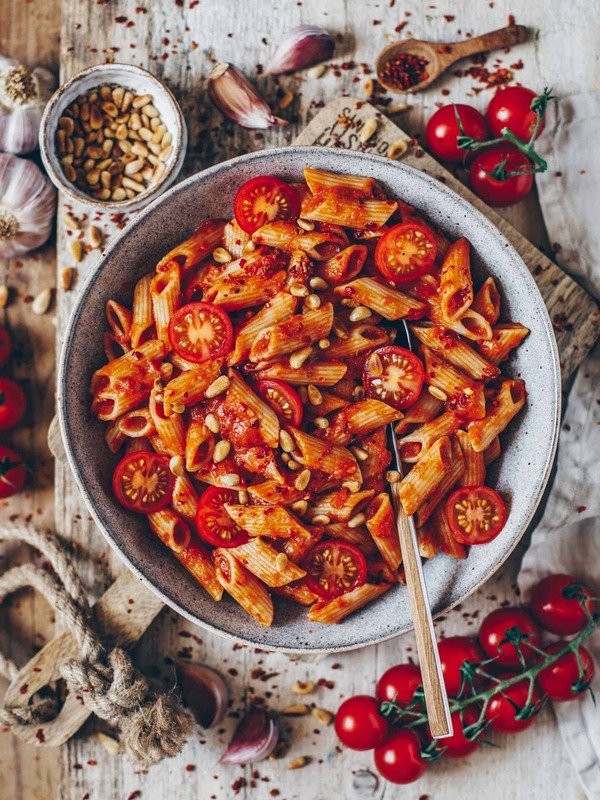 The most important ingredient for a delicious Arrabbiata tomato sauce is, of course, tomatoes. Here you can choose if you prefer fresh tomatoes or tomatoes from the glass/ can. 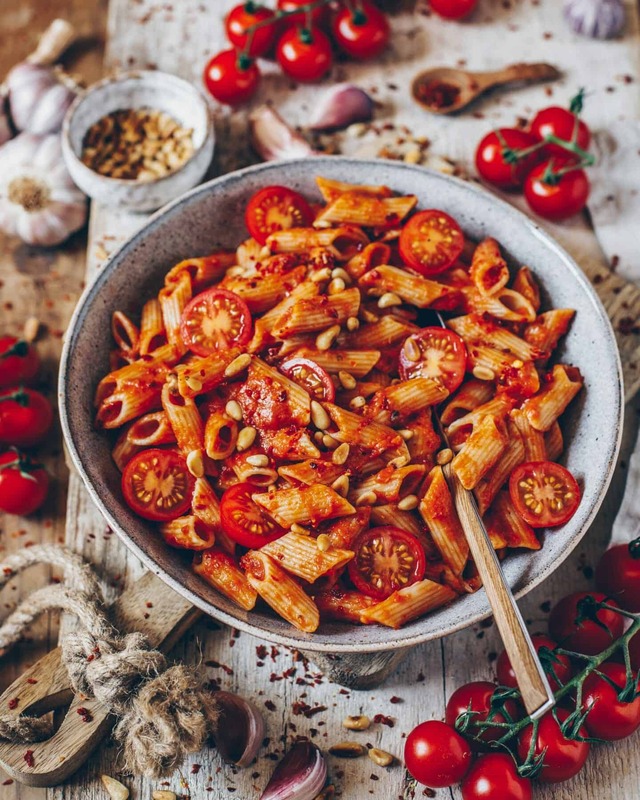 It doesn’t matter if you use whole tomatoes, chopped tomatoes or tomato passata – everything is possible. But I prefer chopped tomatoes. As a topping I like to add some fresh halved cherry tomatoes. I always pay attention to the quality and where it’s sourced. I think it makes a big difference in taste if you buy organic sun-ripened tomatoes or non organic from the discounter. Besides tomatoes, roasted onions and garlic are also important ingredients for the taste. I prefer to fry them in olive oil, as I find it best suits a tomato sauce. Of course, you can also use another oil of choice. Moreover the spices are very important, too. My favorite is the Justspices arrabbiata spice, but you can also use other Italian herbs, as well as pepper and salt. Of course we also need chili for spiciness. Whether it should be more hot or more mild, you decide. With me it is always different. On some days I like it more hot and on some days I prefer it less spicy. I would recommend you to prepare the sauce a bit less spicy first, because you can still spice it up afterwards. The sauce can also be prepared well in advance. You can simply store it in a closed container or jar in the fridge. For example, for the next day for lunch/ dinner or to take to work. I usually store prepared sauces in a large jar with screw cap. These Ball Mason Jars are perfect for that. 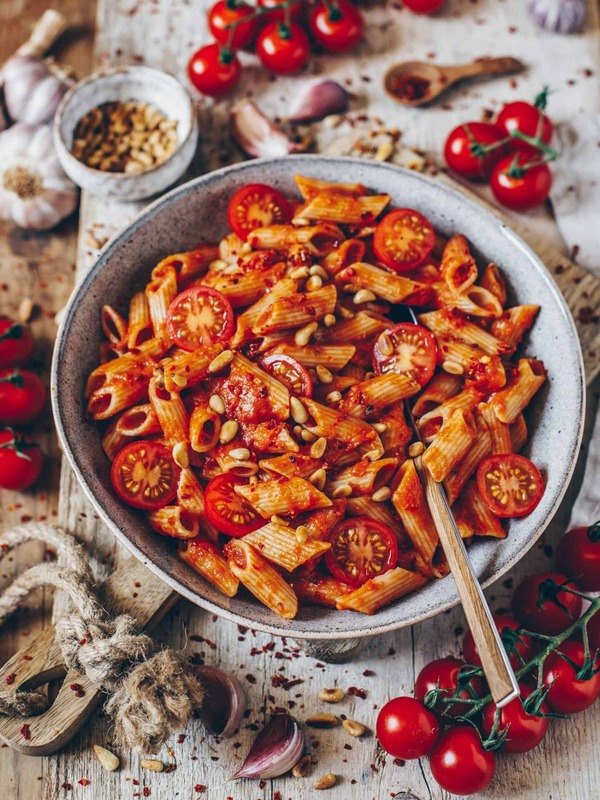 In addition, the Arrabiata sauce is also great as a basis for different other dishes, such as a noodle casserole or risotto. It also works well with gnocchi, ravioli, potatoes and rice. Cook penne pasta in salted water according to the package instructions until al dente. In the meantime, peel and dice the onion. Peel garlic and finely chop. Finely chop the chili pepper as well. Heat the oil in the pan and sauté for 2-3 minutes. Then reduce the heat. Add tomato paste and tomatoes and simmer for about 8-10 minutes. Season with Italian herbs, salt, pepper and a bit of sugar to taste. Then drain the pasta and combine with the sauce. Halve cherry tomatoes and add. Roast pine nuts in a pan without oil until golden-brown. 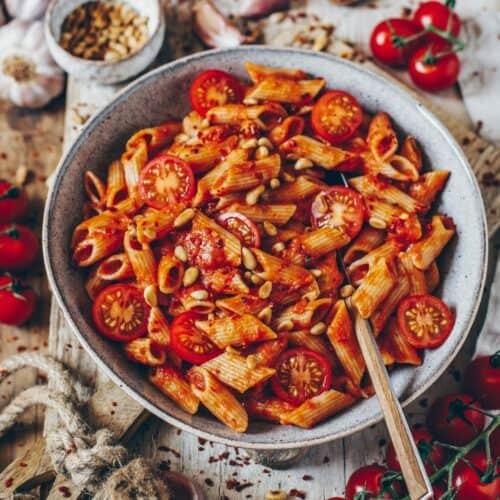 Serve your penne in pasta bowls or plates and sprinkle with roasted pine nuts, tomato flakes, nutritional yeast flakes or vegan parmesan as desired. 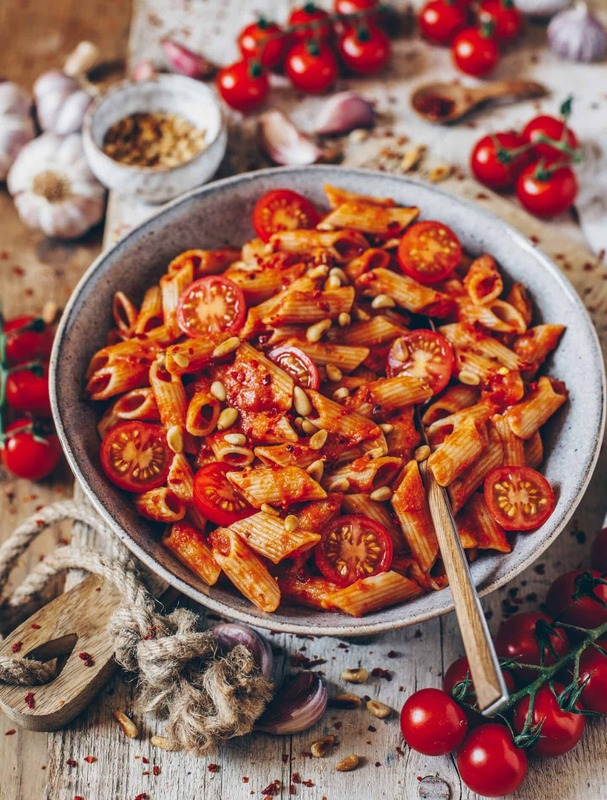 Instead of chopped tomatoes, you can also use tomato passata or 500 g of fresh chopped tomatoes. My favorite seasoning is the Justspices arrabbiata spice, but you can also use other Italian herbs. You can prepare this dish in a versatile way. Even vegetables, such as zucchini, olives, etc. are a delicious and healthy addition. The sauce also goes well with other side dishes, such as gnocchi, rice, potatoes or as a base for a casserole or risotto. If you prefer a creamy sauce, you can add some coconut milk (or other plant-based milk / cream) at the end. This was the most amazing recipe ever , so delicious and tasty , I also used agave instead of sugar ,and fresh seasonings . ❤️ Thank you for sharing this wonderful recipe Bianca ? So glad that you liked the recipe ? I also use agave syrup sometimes. I think it’s a great choice. Just cooked this tonight for dinner and it was so tasty. Spicy but not too much, and very nutrient. For herbs, I put basil and oregano.